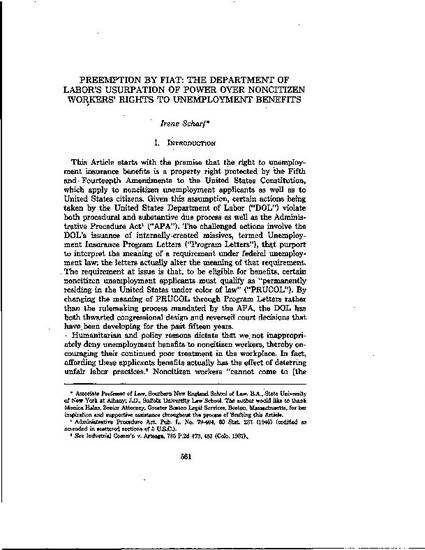 This Article starts with the premise that the right to unemployment insurance benefits is a property right protected by the Fifth and Fourteenth Amendments to the United States Constitution, which apply to noncitizen unemployment applicants as well as to United States citizens. Given this assumption, certain actions being taken by the United States Department of Labor ("DOL") violate both procedural and substantive due process as well as the Administrative Procedure Act ("APA"). The challenged actions involve the DOL's issuance of internally-created missives, termed Unemployment Insurance Program Letters ("Program Letters"), that purport to interpret the meaning of a requirement under federal unemployment law; the letters actually alter the meaning of that requirement. The requirement at issue is that, to be eligible for benefits, certain noncitizen unemployment applicants must qualify as "permanently residing in the United States under color of law" ("PRUCOL"). By changing the meaning of PRUCOL through Program Letters rather than the rulemaking process mandated by the APA, the DOL has both thwarted congressional design and reversed court decisions that have been developing for the past fifteen years. Originally published in the Albany Law Review in 1993. Irene Scharf, Preemption by Fiat: The Department of Labor's Usurpation of Power over Noncitizen Workers' Right to Unemployment Benefits,, 56 Alb. L. Rev. 561 (1993).